I love what this says. Before anything else, God wants us to know who we are. Before we take another step, before we take action, He wants us to remember that He chose us. We are not an accident. God didn’t settle for us. He wants us. He did, He does and He always will. We are holy. When we enter a relationship with Jesus, we are made new and set apart. We are dearly loved. And God doesn’t just say it, he put His love into action through Jesus. God already determined who you are and, more importantly, whose you are -- before you did a single thing or said a single word. Chosen. Holy. Loved. Our actions do not define us -- God does. Our actions do not form our identity, they flow from our identity. Now that God has shown us who we are in Christ, we must respond. We have to exchange our old wardrobe of habits for a new wardrobe, complete with a new set of virtues. I don’t know about you, but patience is not my default during inconvenient circumstances (Put me on the expressway in Miami during rush hour and try me!). It’s not easy to be compassionate when a friend lets you down. It’s not easy to be kind to the cable company call center guy who refuses to meet your simple requests (like this guy). But yet, we are called to follow Christ’s example. That requires an intentional effort from the moment we get out of bed and out the door to the moment our heads hit the pillow at night to be compassionate and patient. Kind and humble. Gentle and patient. There is no one who showed compassion better than Jesus, who healed two blind men desperate for healing even though the crowds told them to be quiet. 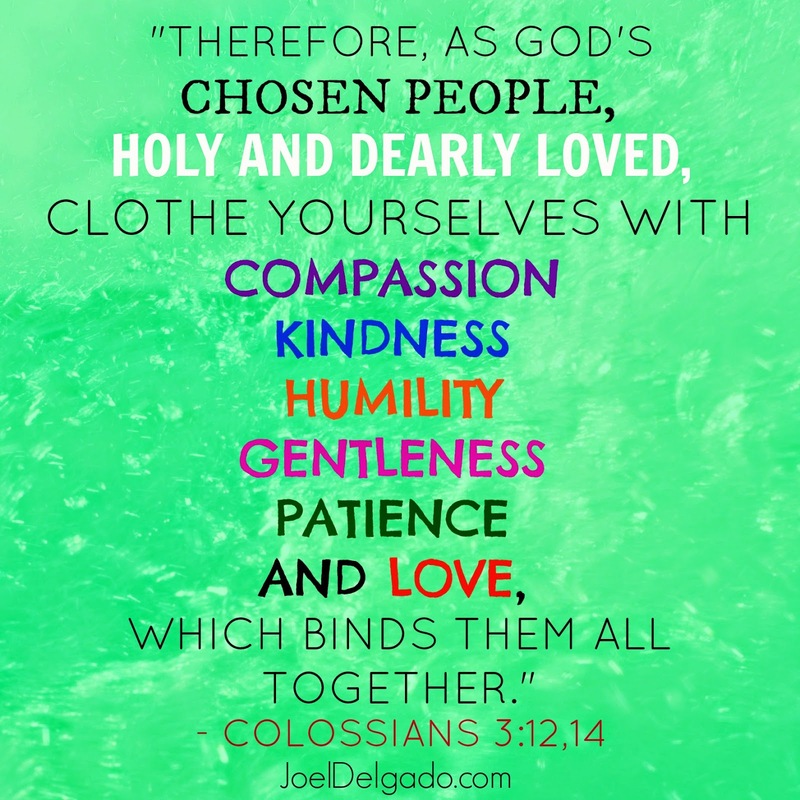 There is no one who displayed kindness and gentleness like Jesus, who extended grace, forgiveness and healing to people who normally would be afterthoughts during His time. There is no one who modeled humility better than Jesus, who washed the feet of His own disciples and submitted to to the will of the Father even in the face of excruciating pain. There is no one more patient than Jesus, whose disciples sometimes had a hard time “getting it” when it came to what Jesus was trying to teach them. But compassion, kindness, humility, gentleness and patience are useless without one thing: love. Love is the string that ties all of these virtues together. It also binds us together, too. Love unites us and tears down the walls that divide us. It was because God loved us that He sent Jesus to save us. It was because He first loved us that we are able to love others. God is love. Without love, nothing else matters and every effort to live the life we are called to live would fall apart. What do you take away from these verses?